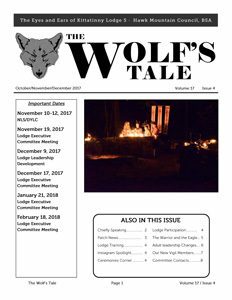 The fourth quarter issue of the Wolf’s Tale is being offered as a download. In this edition you’ll find information about the upcoming Lodge Leadership Training, Leadership changes, new patch information and much more! Please take the time to catch up on lodge activities and events.